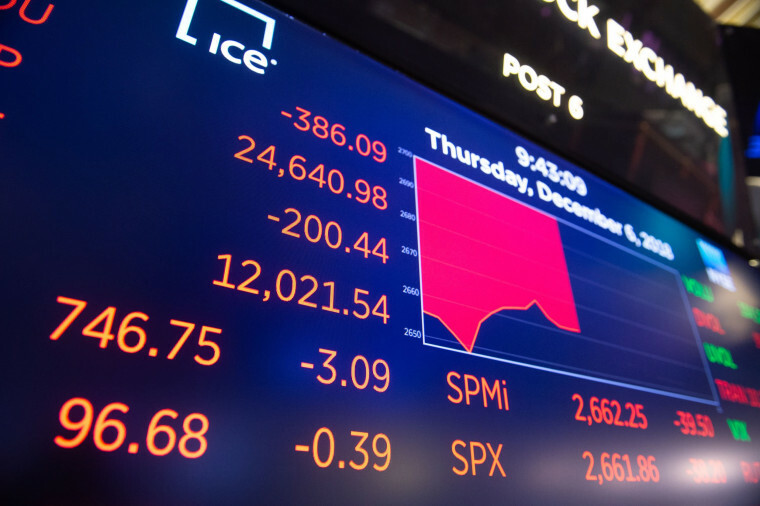 The Dow Jones Industrial Average pared its losses Thursday afternoon, after falling 784 points at its session low. Wall Street had a rollercoaster ride on Thursday, with the Dow Jones Industrial Average swinging from a session low where it was down 784 points, to end the day with a decline of just 77 points. The frenzied day of trading began overnight when news broke that Meng Wanzhou, a high-profile executive at China’s Huawei Technologies, had been arrested at the behest of U.S. authorities as she traveled in Canada at the weekend. That sparked broad fears among investors that the incident would swell into a geopolitical and diplomatic imbroglio, shattering the fragile cease-fire in the U.S.-China trade skirmish. Markets have been on a hair-trigger all week, in response to confusion over the exact details of the trade agreement hashed out by President Donald Trump and China's President Xi Jinping at the G-20 economic summit in Argentina. Global markets had reacted positively to the news of the trade truce, with the Dow spiking by 500 points on Monday. China's Commerce Ministry eventually released a statement Wednesday calling the trade talks "very successful" — but remained vague on the 90-day deadline for negotiations touted by the Trump administration. The arrest of Huawei's Meng now looms large over markets, with investors particularly spooked by the fact that Meng was arrested on the same night Trump and Xi made their alleged promise to work things out. Huawei, where Meng is the chief financial officer, is one of China's largest companies and has been the target of deepening U.S. security concerns. Meng, daughter of the company's founder, was detained in Canada on Dec. 1 amid reports that the U.S. was seeking her extradition because Huawei had violated a ban on sending U.S. technology to Iran. China's Ministry of Foreign Affairs said officials have been contacted both in the U.S. and Canada to demand Meng's release. Continuing concern over a slowdown in global economic growth also contributed to Thursday's wild ride, as well as an inverted yield curve, which happens when the interest on a short-term Treasury bond is higher than on a long-term one. Traders frequently view such an event as an indicator of a recession, since it demonstrates that people are more uncertain about the future. The market gyrations also come as members of oil cartel OPEC met to discuss production cuts and one day ahead of the closely watched U.S. monthly jobs report, which the Labor Department releases on the first Friday of each month. General consensus put the monthly jobs number at a healthy 198,000 — an indicator of continued confidence in the strength of the U.S. economy. Lucy Bayly is the business editor for NBC News.